– Look ma, I’m standing on one leg! and give his mother a big proud smile. She always smiled back and told him he was such a good boy even though she knew he was cheating a bit. The tiny elephant boy wanted to join the circus when he grew up, but he was still a very tiny boy and had to stay with his toys when the big boys were playing in the jungle. He was staring out the window, waving his little tail as he saw them trumping off into the wild. 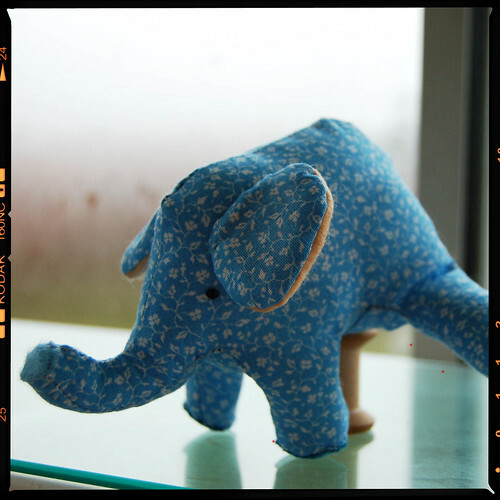 He knew that one day he would be a big elephant and then… then he was going to go after his dream. The thought of that made his heart sing and his eyes glitter. He knew he could do it, he just knew. This entry was posted in Fabric & Sewing and tagged sewing, softies, storytelling. Bookmark the permalink. I see a possible childrens book here. Please give him a big kiss on the forehead from me! Adorable! Like I said on Flickr, I love it! So pretty! But maybe he needs a sister… a pink elephant! He’s so cute! Love the tiny tail! I like your homepage btw, haven’t seen it before and found it today. So cute…what an adorable softie. Aw, thanks for making me smile! He is so well made, and I love his face. You have such a great imagination. Have you ever worked with kids? Oh, he’s WONDERFUL! And your story so sweet. What a way to show off a softie! bravo! 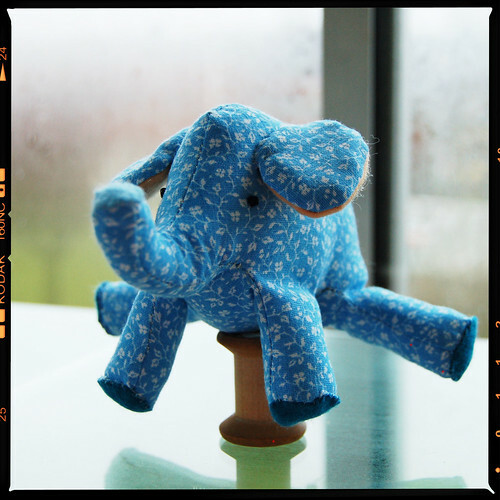 I love your Blue Elephant!!! My ds,ddil&dgrnd live in Sweden. 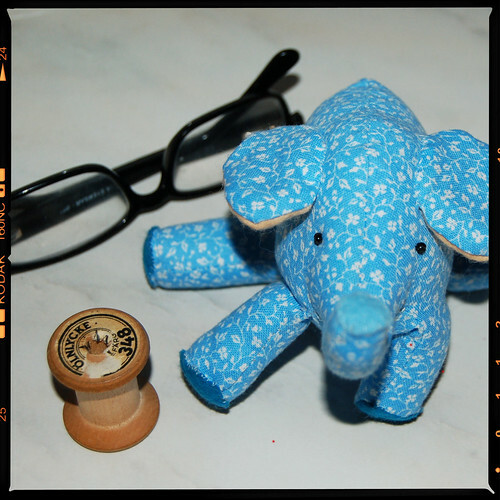 Check out my blue Elephant on my blog if you have a chance to. You’ll have to scroll the pages to find it. I think I posted it either Dec or Nov. It is a Birthday Gift I made some years ago. A collage. Also check Out the pink pony I made if you get a chance. I traced a Vintage Dala as a pattern and twicked it. So it is larger. I posted that in Dec. I have a bit to learn about measurments. The belly to the legs I need to learn how to get the measurments just right. Have a Very Blessed Happy Creative New Year!!! Oh my God! He makes me smile so much!!!! I spelled tweaked wrong above I noticed. adjustments might be a better word. that you wrote to go with the Elephant. So adorably cute – I love it! hey! thanks for commenting on my blog. What a beautiful elephant and such a sweet story. Is his tail made out of bird bands? So cute! awwww! So precious! I love the story instead of just pictures. What a great idea. awww..the elephant’s so cute and the story that comes along with it. love the tail – its a novel way of doing it! He is just wonderful …. his tricks are truly spectacular!!! hihi he is super cute!! Adorable story!! Hei Hanna, supers?t elefant og historie. Og rammene rundt bildene gj?r dem litt ekstra…hvor finner man dem? I love the little elephant. He’s adorable and the material is such a pretty blue. I also am in love with the jean bag you made. I have hung onto an old pair of Levi’s that I haven’t worn in 20 years (aaaaaaaaaaaaah lol) and is a tiny size too. If I can just locate them, maybe I could recycle them and make a bag. thanks for stopping by my blog and I am enjoying yours as well. 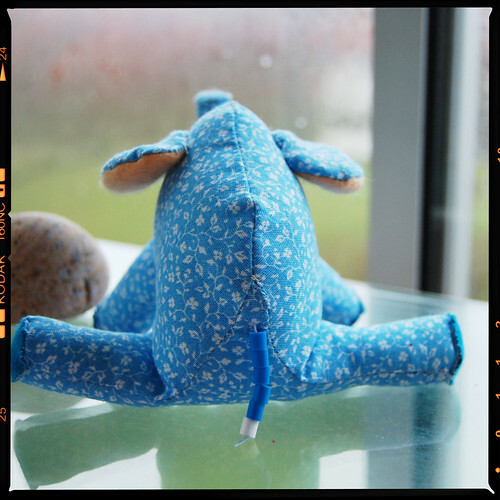 Did you make up your own pattern for this elephant? My sister-in-law is decorating her nursery with elephant theme and green color and I thought she would just love this! Oh I just love this little guy, I hope he never grows up!